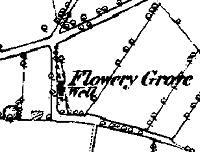 Flowery Grove from the Ordnance Survey map, 1870s. No. 1 Flowery Grove's date plaque. The garden, 2006, from sales literature. The interior, with its supporting beams. Bramhall Lane, 1962, with 295 & 297 shown in blue. Aerial view showing 295 & 297 before demolition (centre). 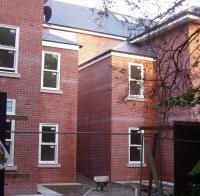 Impression of the finished building, from Seddon Homes website. 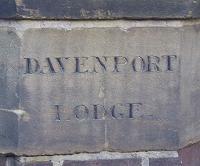 Relic of the past - gatepost of Davenport Lodge. Another original gatepost at Ravenswood. What's the oldest building in Davenport? Not an easy question, as of the few buildings which existed before the wave of housebuilding from the 1860s onwards, such as the original station building of 1858, and the original Jolly Sailor Inn, most have been replaced or removed. The most obvious candidate, is No. 1 Flowery Field, Woodsmoor, a cottage which proclaims its date to be 1833. By coincidence, this home was for sale in September 2006 at the same time as the apartments in what was surely Davenport's newest building, Southlands. This little article looks at these two buildings and their sites. 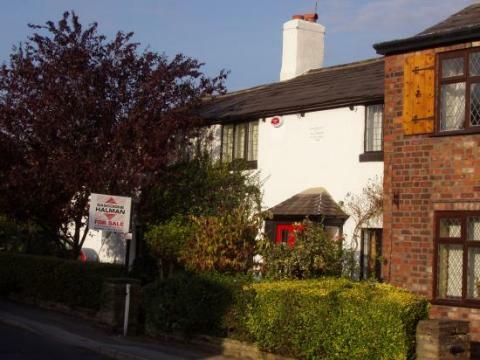 "Built circa 1833 and full of charm and character this three bedroom cottage stands in good size grounds with private gardens in this popular location. The accommodation comprises entrance porch, through lounge, sitting room, good size dining kitchen, three bedrooms and a family bathroom. Double garage, with study and office. Private gardens and driveway. Viewing recommended." The appearance of the house, including the privileged look at the inside and rear given us by the sales information, surely is that of an typical 1830s building, so I thought I'd take a look at some census records to see if I could track down the house and find the "S & L Williamson" whose names appear on the date stone and who surely would have been amazed by the asking price of £375,000. And when and why did Flowery Grove become Flowery Field? The census taker of 1841 was not good on the names of houses, and there are many just labelled 'Great Moor' with no sign we can find of Flowery Grove. It certainly appears in 1851, however, as shown in the extract above. Two families are listed as residing at Flowery Grove, the Williamsons and the Minshulls, all "Silk weavers by Hand." Handloom weaving of silk was common in north-east Cheshire at the time. 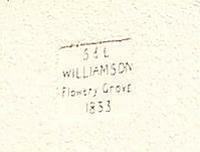 The Williamsons of Flowery Grove in 1851 were Samuel (aged 28), his wife Harriet (24) with the children Hannah (6), John (4), Frances (2) and Elizabeth (2 months). Going back to the 'Great Moor' entries from ten years before, we can find 18-year-old Samuel as the eldest of nine children of John Williamson and his wife Elizabeth, both aged 40. The date plaque appears to be what historians call a 'marriage stone' - commemorating the wedding date of the occupants. The Land Registry record gives a date of 1 May 1826 for a 999-year lease of the land from John Thornley - who farmed the land around, known as Moscow Hall Farm - to Samuel Williamson. 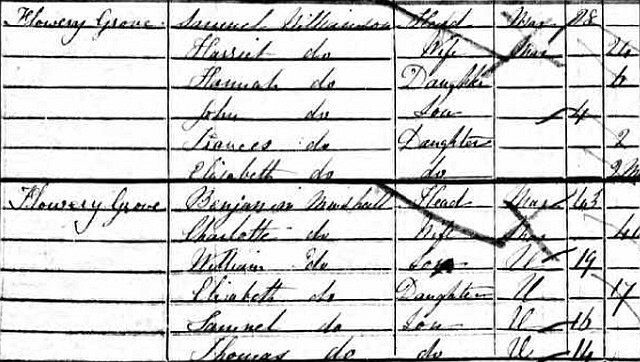 But there is a mystery: The Samuel Williamson recorded in the 1851 census 1851 was, according to the census figures, aged only three in 1826. Could he have signed a lease at that age? Certainly he could not have married in 1833. And his wife's name did not start with 'L'. Baffling. Other Williamson silk-weaving families lived in the area, but they do not fit, either. 1861 sees Samuel and his family still weaving silk, but they are now listed as living at Turf Field Cottages, Woods Moor. 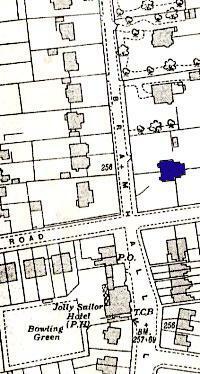 The 1872 map shows these cottages as being on Moorland Road, not far from Flowery Field. In the first decade of the twentieth century, No. 1 Flowery Field (as it was named by 1861) was the home of John Hopwood, railway signalman; perhaps he manned the Woodsmoor Crossing signalbox. Now let's take a look at Southlands: "Ideally situated on the fringe of Bramhall in Davenport, Southlands offers just 16 refined two bedroom apartments set in delightfully landscaped grounds including secure parking behind a prestigious remote controlled gated entrance", says the publicity for this building by its builders, Seddon Homes. 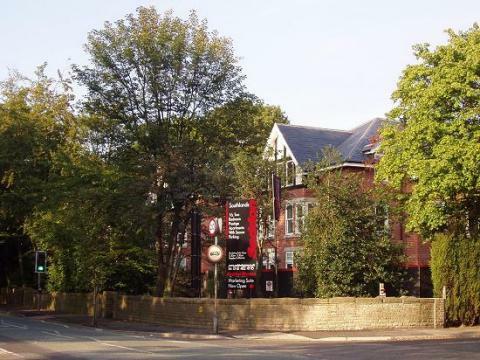 This location, on the corner of Bramhall Lane and The Crescent, lies in the 'Egerton Road - Frewland Avenue Conservation Area' and it is pleasing to see that the builders have been faithful to the "vernacular revival" style found in the area's Victorian buildings, including the slate roof and sash-style windows. Prices - "From £238,000." Most of these disappeared in the 1960s and 1970s. Beaconsfield, the largest house in the area, was replaced by the Church of Jesus Christ of Latter-Day Saints, while Davenport Lodge, Oak Lea, Ravenswood and Fircroft were replaced by apartment buildings, in a modern, although not unsympathetic, style used before the days of Conservation Areas. Happily, these have retained the names of their predecessors, although Oak Lea was altered to Oakleigh. Their original names can still be made out on the gateposts. T & W Lees of Adcroft Street, Battersby & Co of Hempshaw Lane, and William Harrison & Sons of Marriott Street were all major hat factories founded in the late nineteenth century by men who had learned their trade in the town's older factories, Christy's and Carringtons. Naturally, their owners sought suitable residences in what was then the fashionable new suburb of Davenport. 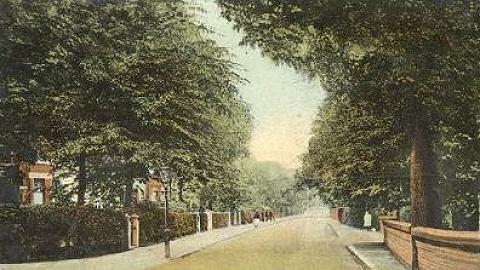 This view, from a postcard of circa 1900, shows Bramhall Lane, looking from the Bramhall direction towards the station. 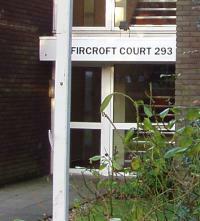 The curved wall to the right seems to mark the junction with The Crescent, so 295 and 297 must be off-scene behind the large tree. The Local History Collection at Stockport Library has an interesting file about Fircroft, no. 293, which includes a photograph of the family and staff posing in front of the huge house. By the mid-twentieth century, the hat industry has run into hard times as the wearing of hats fell out of fashion, the domestic servants needed to look after these big houses became hard to find and really rich people considered that Davenport was too close to urban life for their country residences. On the other hand the proximity of the station with its good service to Manchester made Davenport popular with the new class of office and educational workers, and the old houses were either converted to flats or demolished and replaced by new flats. 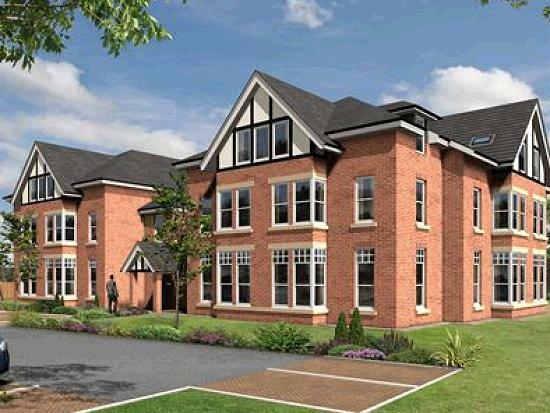 The convenient shops, the bus and train routes and the availability of small flats, have also made Davenport popular with the retired members of the community; the development of Southlands happily continues in this tradition.